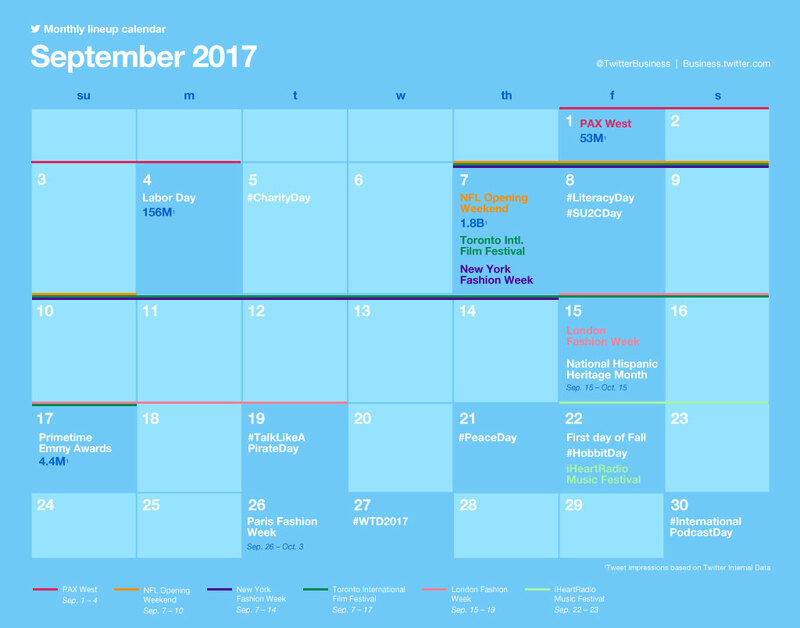 Twitter is a great platform for marking events and special days throughout the year. So much so, that the platform itself almost never forgets to mark a special day with a custom or hashtag-activated emoji. But marketers should also take note. It’s almost September, and as the summer ends, marketers are making their way back to the office, planning for the Fall season, and getting prepared for the next few months up until Christmas and the New Year. But it’s not all about the end of December. There are plenty of important dates to celebrate until then. Let’s take a look at what September has in store for us. First on the radar, we’ve got New York Fashion Week (#NYFW), London Fashion Week (#LFW) and Paris (#PFW) all beginning within a week or so of each other. #NYFW kicks off just before the second week of the month on 7 Sep. and lasts up until 14 Sep. In the meantime, 7 Sep. is also the beginning of the 2017 @NFL season and the beginning of the Toronto Film Festival. That day is probably the day with the most impressions on Twitter, with over 1.8 billion in 2016. Ten days later, another big day for impressions. The Primetime Emmy Awards. Last year, Twitter did a Live Red Carpet event for the #GoldenGlobes. We should be expecting more of that this year for the Emmys, right? Any fashion or film-related brands should take note. There are some other days though, that we should also mark, whether they provide opportunity or not. #CharityDay, #LiteracyDay, #SU2CDay, and #PeaceDay are all days to raise awareness.